The Beatles and Bach stand at opposite poles of my musical life, two great pillars on which my career stands. Without them I’d be a geologist or some kind of computer geek. I’ve chronicled Bach’s influence on me and will do so with the Beatles in the near future. What brings the Beatles and Bach together here is not music, but a peculiar coincidence. With both mentors, I long believed that I knew what their last work had been, and that belief colored how I saw the ends of their careers, and how I saw them. In both cases, I later found out I was wrong, and they changed before my eyes. With the Beatles it was simple. 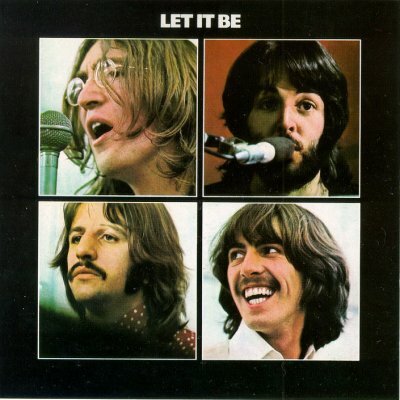 I, along with everyone else for years, believed their last album was “Let It be.” With the exception of the title track and the “Long and Winding Road,” the songs did nothing for me. And the movie, a documentary of making the record, was just plain depressing. The Boys who had defined exuberance in their first, great movie “A Hard Day’s Night” seemed bored and therefore boring. The sour note of “Let It Be” tainted my memory of the Beatles because one of the things that made them such heroes was their impeccable timing in both their careers and lives: they were always one deft step ahead of us, leading us as a generation. Then I discovered that though “Let It Be” had been the last album they released, that the last one they recorded was “Abbey Road.“ Though not my favorite record of theirs, it was respectable, ambitious, and ended on a perfect last note with “The End.” So their real swan song had completed the unique arc of their career with elegance. It washed the sour taste of “Let It Be” from my mouth. What lingered now on my tongue was dark and bittersweet. 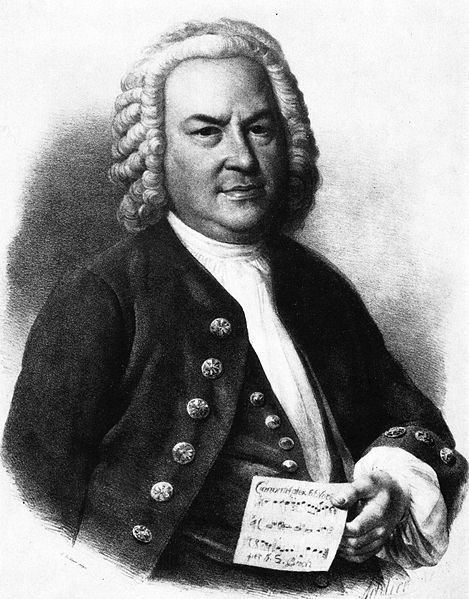 Bach’s career did not end with the breakup of a band, but with his death. As I had heard it he’d been writing the “Art of the Fugue” on his deathbed, and had died in the middle of one of the fugues. The “Art of the Fugue” was a musical treatise on the form he’d brought to the highest point in musical history. The music came to me described as dauntingly complex, too cerebral, so it was years before I dared listen to it. I felt I needed to prepare myself in order to appreciate it. After years of listening to Bach, I finally felt ready. With some trepidation I put on Glenn Gould’s interpretation - the first parts on the organ, rare for him, and the later on piano. After a few listenings I warmed to the piece. Perhaps it wasn’t as passionate as the Mass and Cantatas, but it had the beauty of complex, exquisitely proportioned architecture. The last movement, unfinished, consists of several stages, each rising in intensity, as though in his last hours he neared some final understanding of the fugue, of music, of life. Gould interprets it with special reverence even a sense of drama, as is obvious when he hits that last hanging note, striking it short and hard, saying, “And that’s all HE wrote.” My thoughts rushed into the silence following that note– what had he been about to say? What were we missing? To my knowledge, no composer has attempted to second guess the master and finish it. Yet I assumed that what he would have revealed would have been in the intellectual realm, some further elucidation of the fugue. Some years later I was surprised to find that Bach’s last piece was not, in fact, the Art of the Fugue. He’d abandoned it years before his death. His last work was the B Minor Mass. It didn’t take me long to get used to this new ending to his life and career. Though less melodramatic, it was more fitting. He left us having completed the greatest work in Classical music, which summed up all of the musical styles that came before. And, being a mass, it stood as a final affirmation of the faith that was central to this composer who dedicated all of his works to the glory of God. I rushed to my 17 CD collection of Bach organ music and put on the piece. I found it unbelievable that in his condition he could create something of such serenity, and so sweet. And here in his final work his dedication to the glory of God was not only explicit, but personal, specific to his circumstance. The only possible hints he offers of his coming death are in two brief moments when a voice begins a solitary phrase – and here I’m projecting, seeing him lying there, alone as we will all be at our final moment. Yet in just two beats he’s joined by another voice, which I hear as his faith. And then a higher, louder third voice enters – the chorale melody - and I think it’s clear what that represents: God in heaven, above (Bach often used high and low notes to symbolize heaven and earth). The words of that chorale melody confirmed it. 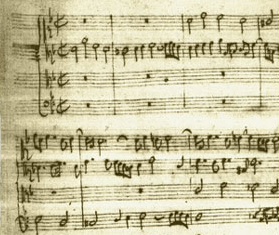 “Before thy throne I now appear.” Its melody enters a second time near the end, and sustains an unusually long time – 3 ½ measures - over the chords below. It’s like the more common pedal tones he set in the bottom voices of his pieces symbolizing the solidity of his earthly, human faith. Here the voice on top symbolizes… his God. As his last utterance sings above, the chords wander a murk of minor uncertainty, last doubts, before settling on a major chord, which the organist sustains for a very long time. I like this ending best of all. I enjoyed your post very much. 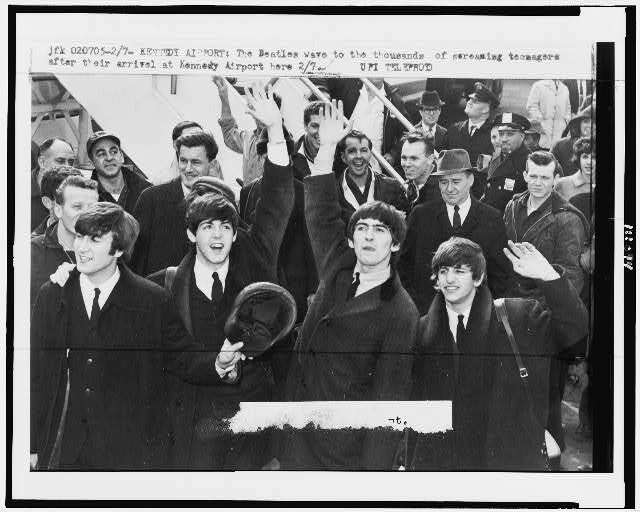 I am a lifelong Beatles fan(see my blog for a couple of posts about it--I'm working on a third). I knew Abbey Road was their final album, and it happens to be my personal favorite, but I am a complete novice where Bach is concerned. Thanks for a little education today on him and it was nice to see a parallel between 2 great artists. As it happens, I have Glenn Gould's Goldberg Variations sitting here next to my laptop. And two years ago, while in London, my family posed while crossing the Abbey Road intersection. Two great pillars indeed. And to think I was excited when I learned the opening riff of "Wipeout"... I still do the run over and over! Those Beatles, such sweet memories. 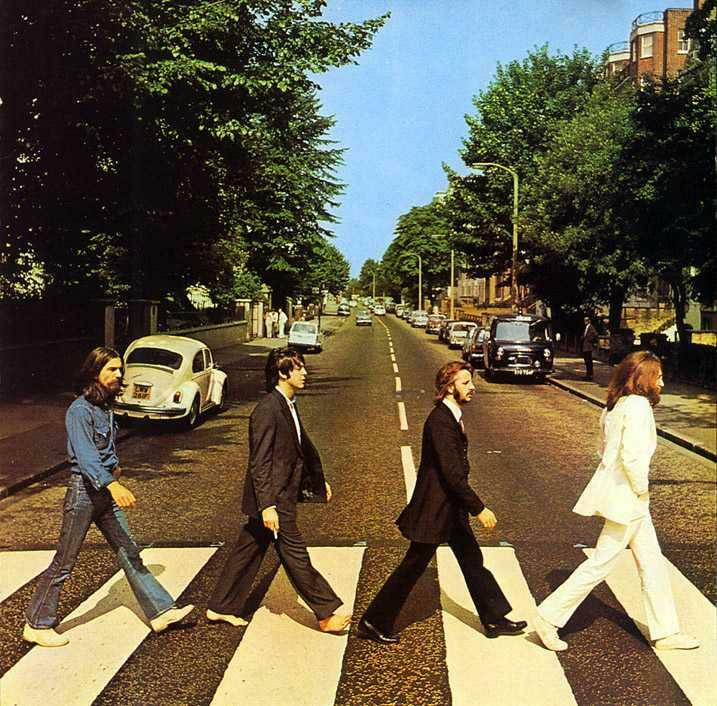 I have always liked most of "Let it Be" but agree that Abbey Road is a much finer ending to their career. Bach: thanks for this info. I will track down and listen to that prelude. Scarlett- ever faithful, "A Day in the Life" is one of my very favorite songs of all time, partially for reasons I can't go into here..
Cranky -We went to that intersection, too. It was a long walk, much harder to get to than St. Thomas in Leipzig! And no plaque, no nothing. Paul - I have not heard that version of the Partita, but will interested to. I believe that as long as you play the notes he wrote, it's very hard to ruin Bach, and I like odd arrangement. I heard the "Goldberg Variations" done by string trio last year. Very impressive but exhausting. The chaconne, of course, is the centerpiece and the story is of Bach returning home in 1720 to discover that his wife, Maria Barbara, had passed away in his absence. Helga Thoene, perhaps whimsically, found themes from hymns that might have been going through Bach's mind as he composed the chaconne. Each of these is performed in turn by the Hilliard Ensemble and finally, their voices are used to highlight the same themes as they appear during the chaconne itself. I know it sounds like a gimmick, but is truly moving as you imagine the agony Bach must have felt during that time. It is more of a drama than a musical recitation.